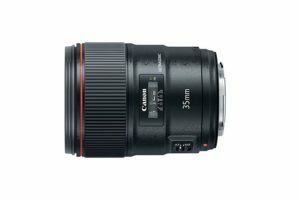 The Canon 6D is often looked at as one of those “bridge” or “in-between” cameras, designed to help photographers make the leap from smaller APS-C consumer cameras to full-frame prosumer cameras.This can be an awkward stage for photographers, so this list of the six best lenses for the Canon 6D should help make the transition easier. The Canon 6D features a 20MP full-frame sensor, Wi-Fi technology, a high native ISO of 25,600, and robust moisture & dust sealing around all buttons and controls. This is also a camera loved by travel photographers, as it’s not as large and heavy as Canon’s other full-frame bodies, and it features a built-in GPS to geotag all of your photos when enabled. The capabilities don’t stop at still photos, as this camera will shoot full HD movies at 30 frames per second. The lenses here will take that into consideration. 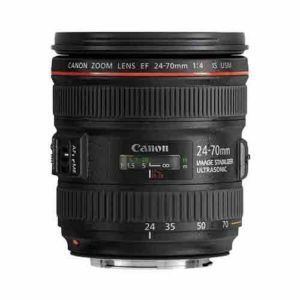 When people talk about the “trinity” of lenses every photographer needs, the 24-70mm is often the first to come up. And Canon offers a great 24-70mm f/4 lens for the Canon 6D. There is a larger, heavier, and more expensive f/2.8 version of this lens, but the f/4 lens is a great place to start. Canon’s L-series lenses have great weather sealing. They also have excellent optical quality with multiple lens elements and specialized coatings to minimize flaring and ghosting, while maximizing contrast and color. This lens is often a favorite everyday lens, especially for travelers. Its versatility will let you get wide angle shots and then zoom just close enough to get in tight on your subject. It works great for landscapes, portraits, and street photography. What reviewers say about it? This lens has been around for a long time, and as such, has had the opportunity to be reviewed by thousands and thousands of photographers. The great news – they’re almost all positive. What photographers like most about this lens is the versatility. This is the one lens that “lives” on Canon 6Ds as it is the most often used, with lens changes happening only for special purposes. This goes across all disciplines of photography as well. Photographers who have never tried macro before love this lens’ macro feature. This gives them even more versatility. This lens has an excellent value for the price. The rugged build, sharpness, and other optical features are usually reserved for much more expensive lenses. This lens has a nine-blade diaphragm to help you get smooth bokeh when working selective focus, even at f/4. Image stabilization also works very well with this lens, giving you an extra four stops of exposure for handheld shots. Canon’s ultrasonic motor performs best in this lens, giving you fast and accurate autofocus when you need it. You can use manual focus override when you need to change your focus distance. Two switches on this lens improve functionality; the barrel lock switch will keep the lens from creeping when you’re carrying it vertically. A macro switch will convert this lens to a macro lens, giving you 0.7x magnification for close shots. For a standard zoom lens under $1,000 this one contains a lot of great features. Image stabilization will give you an extra four stops for handholding the camera, helpful when you wished you had a faster lens. You’ll still get great circular bokeh with the nine-blade diaphragm. Finally, like other L-series lenses, this one has superb weather sealing. This will let you get the most out of your weather-sealed Canon 6D. All of this for under $1,000. While this lens has a decent weight and size for an amazing zoom lens like this, f/4 won’t cut it during low light photography and for Canon portrait photography requiring extremely shallow depth of field. The f/2.8 version of this lens is perhaps an option too heavy and too expensive for many Canon 6D owners. This lens does suffer from one disadvantage commonly found on zoom lenses, but it appears to be more pronounced in this lens. When at the zoom stops of 24mm and 70mm, pixel peepers will notice some softness at the edges. But for everyday photography, this shouldn’t be a problem. The high points: Solid build, affordable, weather sealing. The not-so: Distortion can be distracting, somewhat soft focus. Another lens in the “trinity” of lenses every camera enthusiast should have is the 17-40mm Canon wide zoom lens. This lens is a favorite for landscape photographers and real estate or architectural photographers. This L-series lens features the same outstanding optical quality of other L lenses, weather sealing, and a constant aperture at all focal lengths. 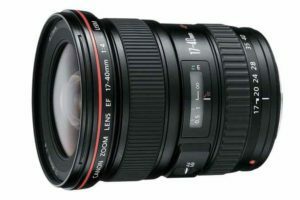 The 17-40mm f/4 lens is also affordable, though it doesn’t feature image stabilization. Image stabilization usually isn’t as important in lenses with as wide a focal range as this, so it shouldn’t be much of a drawback for you. This lens is also lightweight, and small for a zoom lens. There are some L-series prime lenses much heavier and bulkier than this lens, and you’ll appreciate the balance and proportions this lens has on the Canon 6D. This lens needs to be used and processed correctly, especially at wide focal lengths. Barrel distortion is common in this range and is noticeable in this lens. It will especially be noticeable when taking photos of what should be straight lines, like in architecture. The build quality is excellent – one commonly used phrase is “built like a tank”. Landscape photographers aren’t afraid to take this camera out in the elements. This lens isn’t as sharp as the 16-35mm lens, especially when wide open. But it is smaller and cheaper, so it’s a tradeoff that many photographers were willing to take. Sharpness is still certainly acceptable. This lens features a 77mm filter size, and that will save you money if you own other lenses of the same filter thread. You will have to get a filter designed for wide-angle lenses though, as you may get some vignetting at wide focal lengths. The constant aperture is another wonderful feature of this lens, again often found in L-series lenses. This matters more to movie makers, and the Canon 6D is great for 1080 HD movies. If you find that your favorite lens filters don’t work in the front of the lens without vignetting the edges, this lens also has a rear filter holder. Canon’s ultrasonic focusing system works great in this lens; focus is fast and accurate. Lens hoods are difficult to design for wide-angle lenses. It can be tough to find a combination that will prevent flaring without the hood getting in the image. But the lens hood on this lens seems to have more of a problem with flaring. Unlike many other L-series lenses, this one does not feature image stabilization. And at a minimum aperture of f/4, you won’t be able to hold this lens by hand in low light situations without cranking the ISO way up. Finally, even without a filter, there can be some noticeable vignetting at 17mm. This can mostly be corrected with standard post-processing lens corrections. Canon has a few different versions of its popular 70-20mm lens, the third lens that every photographer should own no matter what camera they shoot. The f/4L IS falls in the middle of this lineup. There is also a non-stabilized version for those who don’t want to spend the money on image stabilization, and an f/2.8 version for those who want to spend more money on a faster, heavier, and larger lens. This lens features standard image stabilization, anti-flare lens coatings, and a fast & accurate focus system. 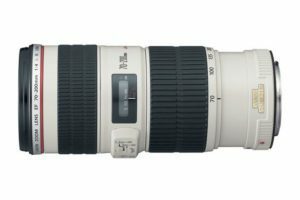 The 70-200mm focal range is often just seen as one for nature photographers, but that’s far from the truth. Anyone interested in doing portrait photography will also love this lens, as it will get you in close to your subjects without getting into their personal space. This is another one of those lenses loved by reviewers of all types of photography. The tight zoom is a favorite for portraits, and is a good range for wildlife photographers as well. A handful of photographers switched to this lens from the f/2.8 and loved the decision based on size, weight, and money savings. Some early lens owners experienced focus issues, but this was most likely either user error or quality assurance problems. There have been no reports of focusing errors with lenses released after the initial release. Despite the multiple anti-flaring and anti-ghosting coatings, some users have noted some ghosting at night. This happens when photographing light sources like stars or lights. This lens has the perfect mix of affordability, optical quality, and build quality. A constant aperture will help you hold a shallow depth of field at all focal ranges, and also add a teleconverter without sacrificing too much light loss. Anti-flare coatings and specialized lens elements guarantee a sharp image, great contrast, and excellent color. Weather sealing makes this a lens that you can really take anywhere. Image stabilization makes this a lens that you’ll be able to use in low light despite the fast aperture of f/4. Focus is always spot-on with this lens. The ultrasonic motor and great optics ensure focus happens fast, and correctly. The gyros for the image stabilization on this lens are quite loud – louder than many other lenses with image stabilization. When you press the shutter halfway to enable the stabilization, you’ll notice what almost sounds like a grinding noise from inside the lens. This is probably the loudest image stabilization system in the Canon system. A standard tripod collar is curiously missing from this lens. You can purchase a collar separately, but they’re usually provided with lenses like this. The lens isn’t grossly heavy, but it is long enough to throw off the balance when the camera is mounted at the body. If you’re looking for an affordable 50mm lens to start working some portrait practice, the 50mm f/1.8 lens is a wonderful choice. 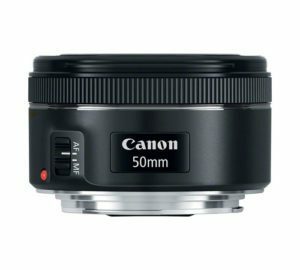 This lens is the successor to an older 50mm prime lens, known to many as the “nifty fifty” for it’s use as the perfect portrait lens. Many photographers go out and purchase the most expensive prime portrait lens they can find, only to discover they’re not suited for that style of photography or that they don’t appreciate a prime lens like that. You could rent an expensive lens, or you could purchase a fast 50mm f/1.8 lens for under $200. Don’t purchase this lens expecting to get thousand-dollar quality images. The quality is still great – but for a lens this cheap you won’t get the quality found in L-series lenses. Most reviewers have noted that this is a great value for the price. When you look at other Canon lenses that sell for around the thousand-dollar range, and then this one that is less than $200, you really get a lot for the money. With that said, there are some issues. Overall, most photographers have problems with various aspects of this lens’ focus system. Some don’t like that, because it’s focus-by-wire, there’s no real physical feedback in the focus ring. There also seems to be a lot of play in the focus ring to get a small focus adjustment. Some other photographers have noted quality assurance issues with the focus quality. This isn’t widespread, and most of the issues should have been fixed by now. Others have experienced issues with focus in low light. This lens is small, light, and cheap. A perfect combination, and you get some great quality given the low price. Even though this isn’t an L-series lens, you’ll still find anti-flare coatings that improve the contrast of this lens. The seven-blade diaphragm will give you some great round bokeh, and the f/1.8 aperture will let you get really selective with the focus. If you need even more focus control, this lens has a manual focus override to really refine where you’re focused. Overall there are just a lot of optical improvements over this lens’ predecessor, which was already a highly-regarded affordable prime lens. It’s odd that this lens still uses the motor when the photographer uses the manual focus. This is just the design of the focus system featured in this lens, but it doesn’t work well for movies. Even when you’re focusing manually, you’ll still experience the noise from the motor. The mount on this lens is very tight. It hasn’t caused any damage to 6Ds or the lens, but it does make a lot of photographers nervous when they’re swapping lenses. There is also some vignetting around the edges of this lens. This, and some issues with focus speed and noise, should have been easy to mitigate with this lens. But then again, it’s less than $200. The 24-105mm f/4L IS II is the second generation of one of the most popular, versatile lenses for the Canon 6D. This lens will give you a little more reach than the 24-70mm, letting you minimize lens changes throughout the day exploring the city. The Mark II series of this lens is only $100 more than the Mark I lens, but features some significant autofocus and image stabilization improvements. The Mark I version had been around for nearly 11 years by the time this second version was released. This lens, being an L-series lens, has some excellent features and superb optical quality. Image stabilization will give you an equivalent extra four stops of light, weather sealing will protect your lens for years, and a constant aperture is something not commonly found on an affordable lens with this focal range. Reviewers have all said that this is one of the best walkaround lenses in the Canon line. The focal range is more versatile than the 24-70mm, and there are times when they’re glad they had this range. The zoom ring is extremely close to the body, and sometimes it can be difficult to zoom the lens without almost scraping your knuckles against the camera body. Early lens users have noticed quite a bit of quality assurance problems. These have been mostly corrected but there may still be a few lemons out there. This lens can be soft when wide open, but that’s the nature of lenses with a zoom range like this. This lens has an surprising ten blades in the aperture diaphragm, giving you really smooth and round bokeh. You won’t get a very shallow depth of field with the f/4 minimum aperture, but you’ll get the most out of what’s available. And on that note, the improved image stabilization system will give you an extra four stops of exposure for handheld shots. Because this is a very popular lens for travel photography, most of those shots will be handheld anyways. This lens is noted to have exceptional stabilization capability. This lens does feature multiple lens coatings to minimize smudges, flaring, and ghosting. A barrel lock will prevent lens creep, and the weather sealing will let you take full advantage of the 6D’s weather sealing. Despite all of the improvements made in this lens over its predecessor, those improvements were really only in technology and not optical quality. The optical quality is still great. Maybe there wasn’t a lot of room for improvement to begin with, but expect the same optics over the predecessor. 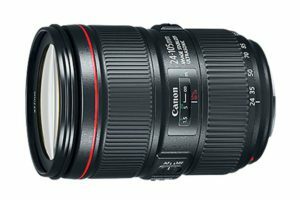 Canon did claim to make many improvements in the optics with this lens, but those claims appeared to have fallen short. As mentioned earlier, the quality is outstanding, but not like what Canon claimed. This lens is surprisingly heavy. It’s only a f/4 lens – it does have image stabilization – but it’s almost two pounds. It’s heavier than the 70-200mm f/4 lens. If you want a bulletproof lens, you’ll get it. The 35mm f/1.4L II is not a cheap lens. But if you’re after quality and have some extra change to spare, this is absolutely worth it. If you don’t have the money to spare, don’t fret. This is the second version of an already popular lens. While this lens does make some improvements over the Mark I, you may be perfectly content with the Mark I if you can’t afford the Mark II. This lens is perhaps the sharpest on this list, and from corner to corner. It features all of the highlights of the L-series lenses, like coatings and weather sealing. One feature it does lack is image stabilization – but at f/1.4, do you really need it? Photographers don’t really have a lot of bad things to say about this lens. The number one culprit is probably the weight. Two and a half pounds is a lot for a prime lens, even for one as fast as f/1.4. It is, however, one of the sharpest Canon lenses that photographers have used with the 6D. It makes a great all-purpose lens, not just for portraits. The 35mm is one of those middle focal lengths that works well for landscapes and street photography as well. Some of the pros will say that this lens is a necessity for professional photographers, and some of the hobbyists were very glad that they spent the money on such an investment. You’ll have to be very careful of your focus when the aperture is wide open. A nine-blade diaphragm, combined with the f/1.4 aperture, will certainly make your subject pop out of the background with smooth bokeh, assuming you use selective focus correctly. This lens features some of the most advanced lens coatings available. You’ll get great contrast, minimal flaring, and the glass will be protected from smudging. The focus is extremely fast and accurate, and can also be overridden with manual focus when necessary. If you need to get close to your subject, you can focus as close as 11” with this lens. Because you’re paying so much for this lens, you’ll want it protected. Canon’s superb weather sealing will help you get years out of this lens. Is it normal that a prime lens weighs so much? The Canon 6D isn’t heavy, but it isn’t very light either. But with the 35mm f/1.4 mounted on the 6D, you will get tired carrying it around. The lens is also large. It almost looks out of proportion mounted on the 6D. There are other f/1.4 lenses much smaller and lighter than this one. And Canon, if you’re going to charge so much for a lens, you should include a carrying bag made of something sturdier than the fabric provided. John is an internationally-published photographer and author. 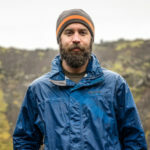 His work mostly centers around sailing, backpacking, and non-profits focusing on environmental conservation. Get the latest photography news, tutorials and showcase series delivered to your inbox. We are currently looking for contributors to write for this site. Do you have photographic experience that you want to share? We specifically require photography tutorial articles and gear tests. Click here to get in touch. Photophique is an online photography magazine founded in July 2013. We cover news, tutorials and showcase the best photography from around the world. Photophique.com participates in the Amazon Services, LLC Associates Program. We may be compensated via a small commission on your Amazon purchase after clicking on one of our published links. Find out more about us, or feel free to reach out us.